Fixie or fixed gear bike (fixed gear), unlike mountain bikes have a transmission that can be permuted, had now become the trend of both young men and women even too many adults who enjoyed this bike. Look at the car free day on Jl. Jend. Sudirman, Senayan GBK up from the roundabout, was filled with cyclists this fixie. This bike style, color issues the taste of the owner. Fixie bike components this year has been very plentiful and cheap. 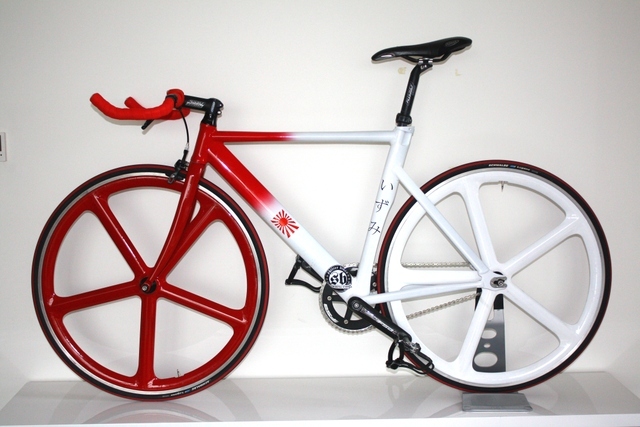 Want to change their tires with red color is fine, or yellow milk is also available, or make a bike with white all too bisa.Urusan frame, frame type of assembly when buying more exciting. Buy a plain frame and in the paint as they pleased owner. To be sure, as it follows the minimalist style. Fixie bike is lighter. Average weigh no more than 11kg, even much less. This entry was posted in Sport And Fun, Uncategorized by ic. Bookmark the permalink.